Azera, Hyundai Motor’s top-selling premium large sedan, returns with technology-rich features for enhanced comfort, convenience and safety; as well as sharper, more graceful styling. The fifth-generation Azera, made with carefully selected premium materials and boasting detailed craftsmanship, arrives in the Middle East six years after its predecessor’s (Code Name TG) launch in 2005, filling the gap between Sonata mid-size family sedan and the Genesis premium large sport sedan. Since its launch in 1986, Azera has sold 1.25 million units worldwide. The all-new Azera is the result of three-and-a-half years and 450 billion won (US $420 million based on today’s currency exchange rates) of research, development and testing. The goal: To create a credible challenger in the luxury car segment with sufficient appeal in styling, significantly improved performance and ride and handling as well as cutting-edge safety and convenience features. The result of the project, code named HG, is the all-new Azera. Hyundai Motor’s new “Fluidic Sculpture” design language continues its evolution in the new Azera. Hyundai designers followed the product concept of “Grand Glide” when developing the new luxury sedan design, seeking a majestic and voluminous form while maintaining a sleek and elegant view from any perspective. Based on this concept, the exterior styling of the Azera is realized in a grand and progressive style that harmoniously connects dynamic character lines and striking surfaces. 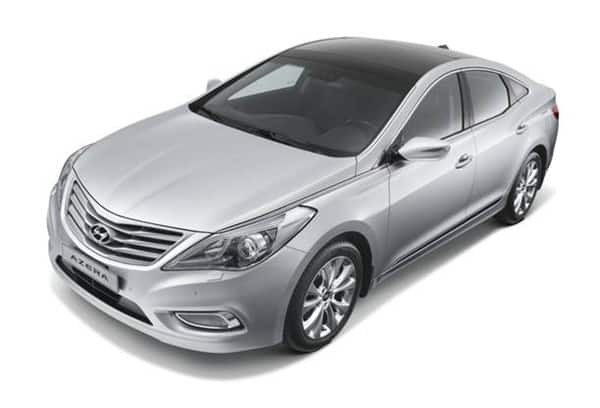 With the aggressive ‘Premium Wing’ frontal image and ‘Eagle Eye’ looking High Intensity Discharge Xenon headlamps (optional), the new Azera creates the look of a powerful and dynamic aircraft poised to takeoff. Its voluminous and wide rear view, restyled from its predecessor, projects strength and authority. The “Grand Glide” styling is carried to the new Azera’s interior as well, as the center console, instrument cluster and dash are integrated into a graceful form that recalls the image of expressive, outstretched eagle’s wings. The optional mood interior LEDs that are placed at key points around the cabin, generating a combination of direct and reflected lighting, add an atmosphere of tranquility and refinement to the Azera. The new Azera’s 4,910mm overall length is same as its predecessor, but the new version is 10mm wider, at 1,860mm, and 20mm lower, at 1,470mm. Moreover, a 2,845mm-long wheelbase -- 65mm longer than the previous version -- guarantees comfortable seating for up to five adults, offering generously increased head room, leg room and shoulder room for the driver and front-row passenger. The rear floor hump is lowered by 77mm, improving the comfort of the rear-row center passenger. Compared to leading competitor models, the new Azera’s interior space is bigger by nearly every measurable indicator. The new Azera’s drag coefficient (Cd) of just 0.28 is superior to its rivals, which average a 0.31 Cd. Ground clearance lowered by 21mm. Deflectors in the front/rear wheel and center floor and covers under the engine room and fuel tank minimize air resistance in lower areas and improve the Azera’s fuel economy. The new Azera comes with a choice of two remarkably advanced and fuel efficient gasoline engines: The six-cylinder Lambda-II 3.0-liter MPI (Multi Point Injection) and the inline four-cylinder Theta-II 2.4-liter MPI. Both are built on an all-aluminum body, which minimizes weight, and use a roller chain drive system that significantly reduces engine noise levels. The system requires far less maintenance than the silent chain-drive system of previous engines. The Azera features a new standard six-speed auto transmission engineered and manufactured entirely in-house alongside its engines. With an ultra-flat torque converter, the new transmission has highly compact dimensions and is extremely lightweight. Furthermore, a four-pinion differential enhances durability while adjustable solenoid valves guarantee precise shifting throughout the life of the vehicle. The new Azera rides on MacPherson struts up front and a Multi-link suspension in the rear. Coil springs and high-performance Amplitude Selective Dampers (ASD) installed on all four corners as standard equipment help maintain optimal damping and level qualities on smooth surfaces and offer more precise road contact for greater stability and control in corners and on rough surfaces. Maximum passenger safety is achieved through a cutting-edge chassis design that absorbs and distributes crash energy throughout the Azera’s body. In addition, key structures have been reinforced with ultra-high tensile strength steel for better crash protection. To help the driver avoid accidents proactively, the new Azera offers a suite of high-tech safety systems including ESC (Electronic Stability Control) and TPMS (Tire Pressure Monitoring System). Braking performance also has been significantly upgraded with four disc brakes: two 16-inch (17-inch optional) discs up front and two 15-inch discs in the rear. Up to nine airbags – including a driver’s knee airbag – are available in the new Azera. The Azera seeks to minimize neck injuries resulting from rear-end crashes by employing a new seat back-structure system and standard low-elasticity active headrests. The new Azera not only features a standard Automatic Cruise Control but also offers an optional Advanced Smart Cruise Control (ASCC), which automatically keeps a safe distance from a car ahead and provides automatic stop and restart functions in response to traffic flow. The Azera separates itself from other large sedans with a number of features including a wide panorama sunroof; top-quality Nappa leather seats; front seat warmers; front air-ventilated seats; high-quality suede (tricot) interior; a power driver’s seat that can be adjusted in maximum 12 directions; a uniquely styled button-start smart key; and an Electric Parking Brake, which replaces the traditional foot pedal or hand brake with a simple switch. Hyundai aims to sell 100,000 Azeras this year; 80,000 in the domestic market and 20,000 outside of Korea. In 2012, when major launches in overseas markets are planned, Hyundai plans to sell 120,000 units globally.